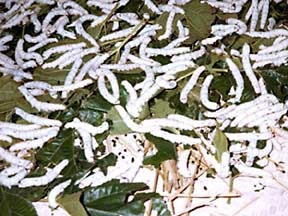 The culture of silkworms (Bombyx mori) began in China about 5000 years ago. The ancient Chinese were the first to discover that the cocoons of a lowly caterpillar could be unwound and the filaments woven into some of the most beautiful fabrics in the world. Silk was so highly prized that the lustrous fabrics were reserved exclusively for the royalty of China. The secrets of silk production were closely guarded by the Chinese for thousands of years. It was not until about 300A.D., that sericulture spread to Korea and from there to Japan. In 552 A.D. two Nestorian monks, under orders from the Emperor Justinian, smuggled silkworm eggs from China and bought them to Europe. This was the beginning of the silk industry in the West. Sericulture spread rapidly throughout Europe and Asia during the following centuries. The English began making silk in the 13th century, but their success was limited by their cool and damp climate. Silk culture began in America in 1603, when silkworm eggs and mulberry seeds were sent to Virginia by order of King James ! The English hoped to rival the French and Italians in silk production, by having the American colonists raise silk for them. Silk was produced erratically in Virginia and Georgia until about the 1760’s. By this time, cotton and tobacco had proven to be more lucrative products for the southern colonies. 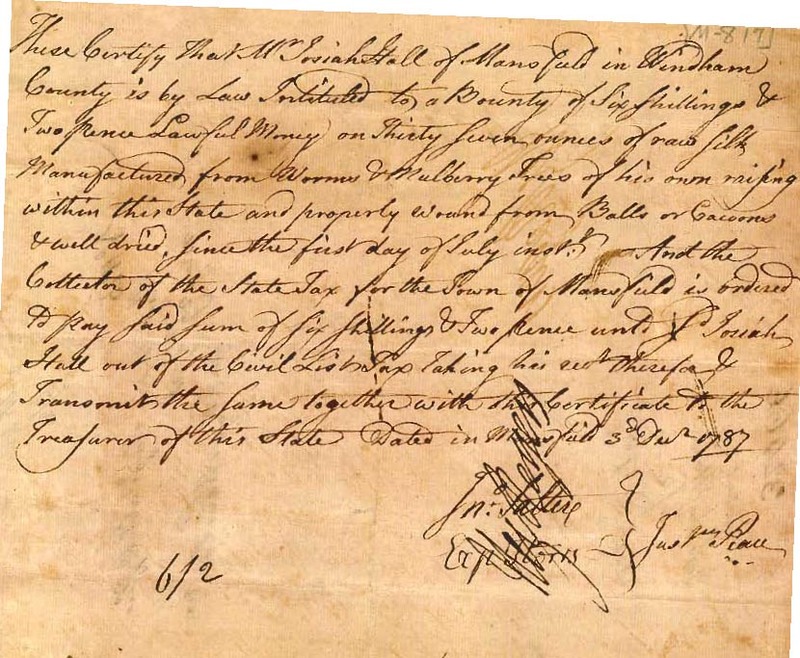 About 1760, Nathaniel Aspinwall, a native of Mansfield who had a mulberry orchard on Long Island, began to promote silk culture in Mansfield and nearby towns. He planted an orchard in town and in 1762, he brought the first silkworm eggs to Mansfield. With the aid of Dr. Ezra Stiles of Yale, he persuaded the legislature to pass an act which paid ten shillings bounty for every one hundred trees planted and three pence per ounce for raw silk. The legislature further encouraged the culture of silk by sending a half ounce of mulberry seed to every parish in Connecticut. Silkworms were raised throughout the state in the late 1700’s but only in Mansfield and some of the surrounding towns did the home industry continue much beyond the turn of the century. By 1800 three quarters of the people in Mansfield were raising silkworms in their homes. The men probably planted the trees, then women and children gathered the leaves, cared for the worms and reeled and spun the raw silk. A spare room, an attic, a barn loft or an out building was used as a cocoonery. In 1830, the Chinese Mulberry (Morus multicaulis) was introduced from China. It was highly touted as superior to the White Mulberry (Morus alba). It grew rapidly, was easily propagated from cuttings and silkworms fed upon its leaves produced higher quality silk. The culture of M. multicaulis was promoted by Congress and soon growers up and down the Atlantic Coast were caught up in a wild speculation that rivaled the “Tulip Bulb Craze” in 17th century Holland. Prices rose rapidly as people rushed to invest in the new mulberry variety. 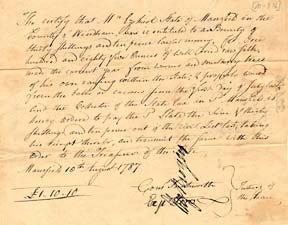 In 1834, one year old trees sold for $3 to $5 per hundred. Soon the price rose to $500 per hundred and ultimately two trees sold in North Windham for $100 a piece. The value of the trees was soon greater than that of the silk that could be obtained from them. Around 1840, the market for M. multicaulis crashed and many fortunes were lost. Disillusioned farmers tore out their mulberry orchards and the whole business of silk culture fell into disfavor. Silk culture remained a profitable home industry in Mansfield until about 1844 when a blight devastated mulberry orchards throughout the country. The blight coupled with the crash of the M. multicaulis market led to the demise of silk culture in America. Few continued to raise silkworms after mid-century and those who did found it difficult to compete against foreign countries like China where labor was cheap and plentiful. The local silk factories, which were well established by this time, continued to operate using imported raw silk. In the early days of Mansfield’s silk industry, the silk cocoons were unwound in the home using a simple hand reel — the same as was also used for measuring skeins of woolen yarn or linen thread. The cocoons were placed in a kettle of hot water and then were stirred with a brush. The silk fibers which adhered to the brush were then attached to the reel. Usually about ten cocoons were unwound (reeled) at a time. The fibers were pressed together to form a single strong thread which could then be easily wound as the reel turned. 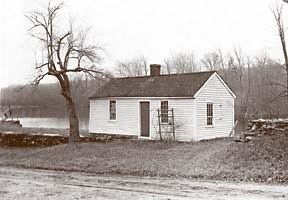 The Hanks Silk Mill was built in 1810 by Horace and Rodney Hanks on the brook near 198 Hanks Hill Road. Using water from the brook to propel their machinery, they attempted to make sewing silk and silk twist. The mill was not a commercial success due to the crudeness of the machinery. However the mill is of great significance as the first in America to utilize water power. This was the first step towards mechanization in the American silk industry. Hanks silk mill with reservoir pictured in the background. Mansfield- date unknown. Recognizing the significance of the Hanks Silk Mill, Henry Ford purchased the building in 1930. It was reconstructed in his Greenfield Village Museum in Dearborn, Michigan, where it can be seen today. In 1827 or 1828, a young throwster named Edmund Golding came to America from Macclesfield, England. He arrived in Mansfield, which was then considered the center of the American silk industry, expecting to find ready employment. He was disappointed, however, to find that the American silk industry was far behind that of England. The doubling and twisting operation he was trained in was here crudely done on the hand spinning wheel. Alfred Lilly took an interest in Golding and persuaded him to describe the machinery he had used in England. Believing that Golding’s drawings were sufficient to produce workable machinery, he formed a partnership with Capt. Joseph Conant, William Fisk, William Atwood, Storrs Hovey and Jesse Bingham. The company was incorporated under the name Mansfield Silk Company in 1829. The doubling and twisting machinery built under Golding’s direction was an improvement over the accelerated spinning wheel used in the Hanks silk mill, but it was unable to operate using the crudely reeled local silk. At Golding’s suggestion, the company began to import raw silk from England and with this they achieved moderate success. The new mill attracted many visitors to Mansfield. Among them was Edmund Brown, another Englishman who had a silk tassel business in Boston and hoped to find a local source of raw silk. He was familiar with the English method of silk reeling and was able to direct the company in producing a more effective reel. In the following years, a number of improvements to the reeling process were suggested, including the French “Piedmont Reel” introduced to Mansfield in the 1830’s. It was Nathan Rixford, however, who finally resolved the problems of reeling native silk. Rixford, who had just established himself as a builder of machinery in Mansfield Hollow, visited the Mansfield Silk Company’s mill and examined its machinery. He then made considerable improvements upon it and in 1839 began to operate his own silk mill in Mansfield Hollow. With his improved machinery, he was able to produce, for the first time, reeled silk that was equal to the imported variety.